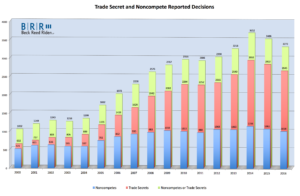 In preparation for an upcoming discussion of trade secrets law for PLI in San Francisco (Trade Secrets 2017: What Every Lawyer Should Know), I reran my chart of noncomepte and trade secrets decisions. As regular readers of this blog know, several years ago, I became curious to see how many reported trade secret and noncompete decisions were issued each year in all of the federal and state courts around the country. So, I did a “back of the envelope” calculation. I have performed similar calculations every year since. I should note that each time I’ve run the queries, the results for each year have varied slightly (inching up over time), which I attribute to Westlaw’s addition of cases over time. Consistent with that, the older the data, the less it moves. Indeed, some of the oldest data didn’t change at all. The other thing worth noting is that every time I’ve run this inquiry during the first half of the year, the most recent year or two has been way underreported. I suspect that it has something to do with how Westlaw updates its database. Even when I run it later in the year (as I did now), the data for those last two years remains significantly underreported. Oddly, for the first time in all the years I have run this, this most recent update seems to have caught some recent updates to Westlaw’s database – going back as far as 2008. Specifically, when I ran the numbers today, I found that data going back to 2008 increased significantly from when I last ran the data, only 6 months ago (on April 21, 2017). Despite the database changes, the trends have remained largely the same. 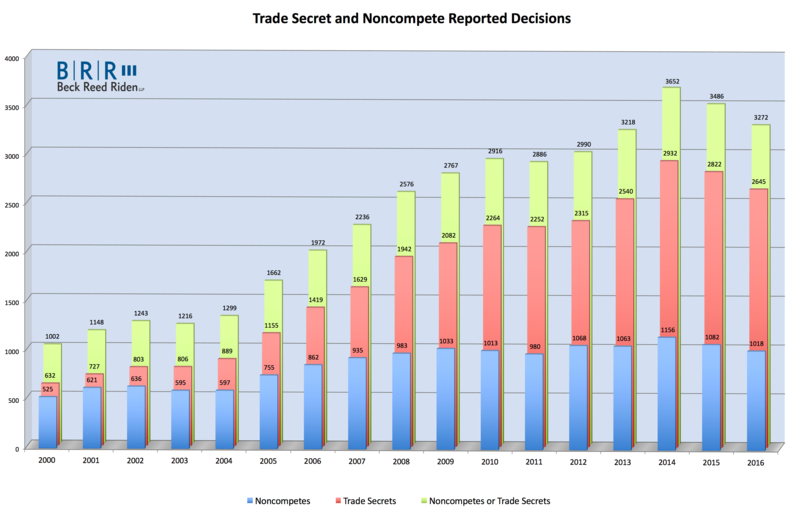 Perhaps most telling is that while noncompete litigation has ticked up and down over the last decade, with a moderate trend upward, trade secrets litigation has increased almost every year, with a significant upward trend. In addition, with the exception of 2015 and 2016 (which will likely turn out to be an artifact of the Westlaw database issue), only 2011 shows a slight dip for both trade secrets and noncompete litigation.